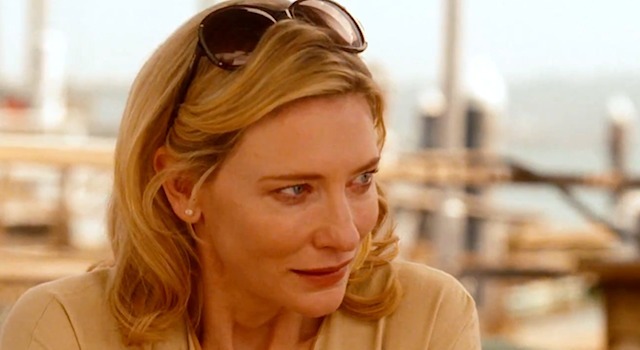 There’s a lot of denial going on in Blue Jasmine, the 45th feature film written and directed by Woody Allen (Hannah and Her Sisters). Most of it comes from its title character, Jasmine (Cate Blanchett, Hanna), who used to go by the name of Jeanette until she changed it to a moniker more befitting her one-time life as Manhattan socialite married to a super-rich Bernie Madoff-esque New York financier (Alec Baldwin, Rock of Ages). But that was a lifetime ago, as we quickly learn when the recently widowed Jasmine arrives in San Francisco and moves into the humble apartment of her divorced sister (Sally Hawkins, Never Let Me Go) and two nephews. The story splinters into two directions, moving forward as Jasmine struggles to accept the new limitations of her considerably less-moneyed life, and flashing back to New York and the glamorous life that came to an abrupt end when her husband’s nefarious dealings were discovered. 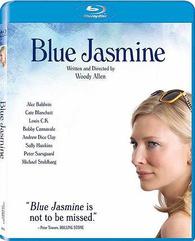 Only the second production Woody has made in the U.S. in the past decade (the other being the 2009 Larry David starrer Whatever Works), Blue Jasmine’s startlingly contemporary and very American story benefits from two foreign imports: Cate Blanchett and Sally Hawkins, both of whom are nominated for Academy Awards for their work here (Blanchett for Best Actress and Hawkins for Best Supporting Actress). The men in the lives of Blue Jasmine’s two talented leading ladies are all made in the U.S. and include Baldwin, Louis C.K. (TV’s Louie), Bobby Cannavale (Roadie), Peter Sarsgaard (An Education), Michael Stuhlbarg (A Serious Man) and Andrew Dice Clay. Like the women, all are quite fine, particularly Clay, who gets an opportunity to shine as a working class Joe whose feelings about denial ultimately play a major role in Jasmine’s struggle to regain the life she has lost. The film looks and sounds grand on Blu-ray, with Woody’s camera doing a respectable job of exploring the streets of San Francisco and an even better one as it tracks through the rarefied world of New York’s super-rich. As is usually the case with Woody’s films on disc, the bonus features are scant. There’s a Notes From the Red Carpet piece, which finds the cast discussing the film and their take on the characters, along with a cast press conference featuring Blanchett, Saarsgard and Clay as they wax rhapsodic about working with one of the world’s most consistently strong and prolific filmmakers.